I lived in New York for five years. I’ve flown back and forth between here and there dozens of times. For a six month period I even flew with an expired passport without even knowing it. Yesterday when I peeked at my passport and realized that it had expired a month ago, I knew it was a huge problem… because I’m flying to New York City this afternoon and things have changed. As of January 2008, if you’re flying to the US, you MUST have a valid passport. Expiration dates on passports are not like expiration dates on yogurt. Yogurt is still good just after the date on the container. Porter Airlines confirmed that passports are not valid if they are expired, even if they just expired. Even if you have your birth certificate, driver’s license, health card and sing a sad song. If you know how I feel about New York, you’ll know that not going on this trip was not an option. Especially when this is my first holiday in two years. I decided to attempt to get my passport done in less than one day. My brother went through the same horror before a trip to Cuba a few months ago. (does this run in the family?) He got his processed in eight hours. I had less than five. By the time I got all my signatures, photos and forms filled out, I arrived at the passport office at 2pm, leaving 3 hours for processing. The Urgent passport service requires 24 hours for processing. I expected the pre-screener to laugh at me, but she just listened to my apologetic story and put me in the front of the line. No questions asked. The processing agent also listened to my tale of woe and seemed skeptical, but went to confirm if it could be done. As long as my references answered their phones, then I could get my passport in one hour. At 3:30pm, I went to pick up my passport and it was ready! I’ll be in NYC until Tuesday afternoon. Next week I’ll be back with too many stories and photos and you’ll probably have to tell me to shut about it and get back to making stuff. I am so excited for your trip you’d think I was going! I’m glad the passport fiasco had a happy ending . . .
i love those polaroids, karyn! did you take them yourself? have a great and relaxing trip to new york! i hope you blog about it! Have a fantastic trip!! Tell us everything when you get back!! 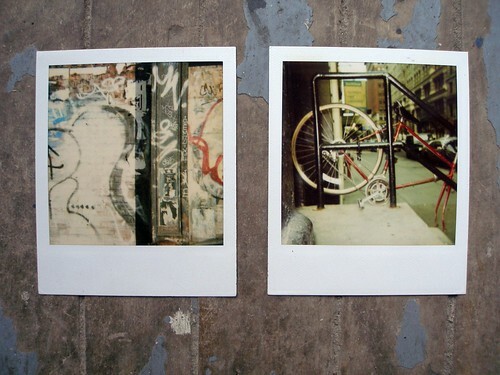 melissa – yes, those are polaroids that i took when i first moved to new york. johanna – i’ve got a full nyc report coming with all my very favourite places.